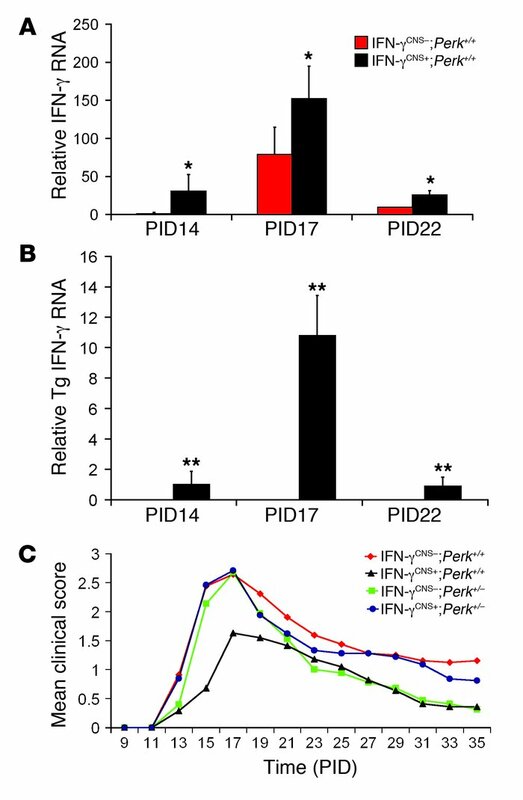 CNS delivery of IFN-γ before EAE onset ameliorated the disease course dependent on the PERK pathway. (A) Expression pattern of total IFN-γ in the course of EAE (n = 3). (B) Expression pattern of transgenic IFN-γ in the course of EAE (n = 3). (C) Mean clinical score (n = 25). Error bars represent SD. *P < 0.05, **P < 0.01 versus IFN-γCNS–;Perk+/+; Student’s t test.